This is my new favorite anime...it has everything you could want. Romance, a fantastic story and even more fantastic creatures. Originally this show was suppose to run for 52 episodes, but due to narrow minded network exec's, it was shortened to 25 episodes...and cancelled. Luckily we at least got a 5 episode OVA out of it. Still, there's a lot of unanswered questions. How unfortunate. Another superb anime by Bones. This story is truly excellent (excuse mistypes this is via mobile phone) Although older and thus only in 480p its very well drawn and executed. The story itself manages to both entertain and inform, and best of all the damn thing actually has...gasp...a beginning middle and end! I nknow it was cancelled early but they do a decent job ending this. Don't skip it thinking you will be frustrated, I wasnt. There wasn't a single one of these I felt to be non entertaining. You get another unique mechanic for the hero's "Super power" out of Bones here too. They delve into some of Japan's dirtier history in the Edo period and explain why some things were done that I personally found quite interesting and do it in such a way as to not take away from the quite wonderful face punching. You get to learn a little bit about how the Japanese language came to be as well which is cool. You get a feel for the maneuverings of the historical figures of the times and they do a nice job of depicting the greys of the times before the black ships. Im not some huge history buff and I didnt get lost in the history telling, it was slipped in nicely. Ghost Slayers Ayashi is an impressive anime series that was unfortunately stopped before it could become great in my opinion. You can tell how the creators of this series wanted to go in different directions especially in character development and story but unfortunately was unable to do so due to the limited amount of episodes. That being said, it is a wonderful series filled with with a mix of real world history and fiction that will surely please anyone interested in Japanese history or mythology. Also, what I do enjoy about this is that the main character is not your typical teenager/early 20s protagonist as in many anime series, instead he is in his early 40s and the voice actor of this character wonderfully portrays the maturity and gravitas needed for a character of that age. This anime is not well known but I strongly suggest you give it a shot, you won't be disappointed. This was really quite good. I had never heard of this one... but I really enjoyed watching it. The story is about characters wanting only to return to the Other World... death... and they can't enjoy their lives. One thing that keeps them going is the desire to kill and eat beasts from the Other World... it gets complicated as these beasts are gods of the land and people can turn into these creatures from the Other World also like a virus. It gives or at least hints at a deeper message of people asking what this world is we live in, and if it is better to be dead. Really interesting story and good artwork. The ghosts or monsters were really cool looking and there were a lot of high action fight scenes. I think the only issue I can say is that the character designs... it took a long time for me to remember who was who... often characters would look the same. This was some fabulous, rich storytelling, which tethered its fiction to points in Japanese history. The central protagonist is man who has not been home for 25 years, having been "spirited away" as a youth, he is uniquely gifted and marked to wrestle with how to make peace with his difference. The anime explores the virulent xenophobia of Japan at the time -- killing foreigners and imprisoning any who studied the West - a willful blindness. Amid this roiling turmoil, the cast of characters battle to realize themselves and save civilians from Youi - creatures which eat people, destroy property and wreck supernatural havoc. This has so much to recommend it how did I miss it as it aired? 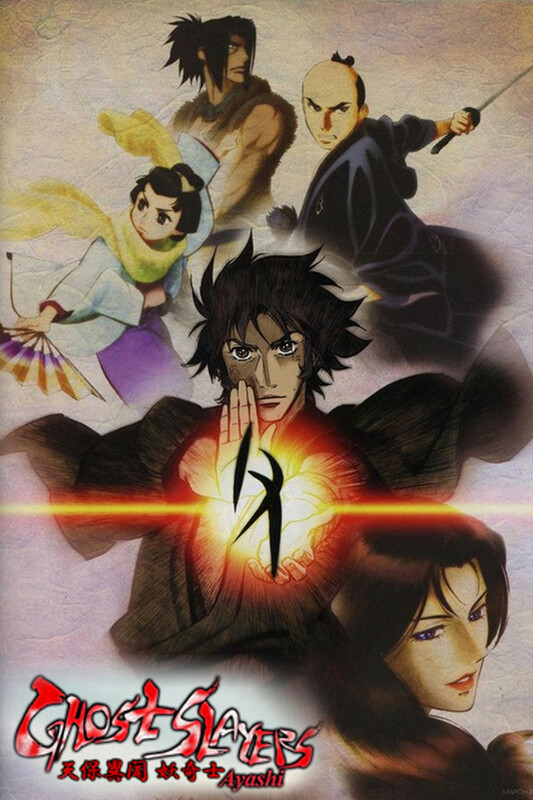 The cast includes requisite young teens, cute girls, a cross dressing priest, a talking horse/dragon, failed samurai, samurai, prodigal sons, but the issues all wrestle with are transcendent: why live and what is your reason for being? The monsters are interesting and there are costs paid for every resolution. There are several story arcs and the idea that there is a power in naming and hidden meaning in the derivation of names is one well worth exploring. Wish the series was able to fully unfold its wings and soar on, but it was a wonderful flight.